Temperature control units are often connected to the application with insulated hoses (e.g. a reactor). 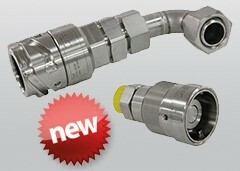 There are different applications to be connected to the unit, then our quick-disconnect couplings are recommended. The quick-disconnect fills the special requirements that temperature control requires and reliably prevents leakage of thermal fluid. The quick-disconnect produces only a small pressure drop and allows good performance of the entire system. If pressure sensitive apparatus is used, then we strongly recommend use of the optional adaptor 10417 to connect an operator supplied pressure relief system in the application´s flow line. Glassware can be protected from the danger of damage through bursting.